Nothing says "summertime" like a tasty watermelon treat. But this dessert only looks like the fruit. 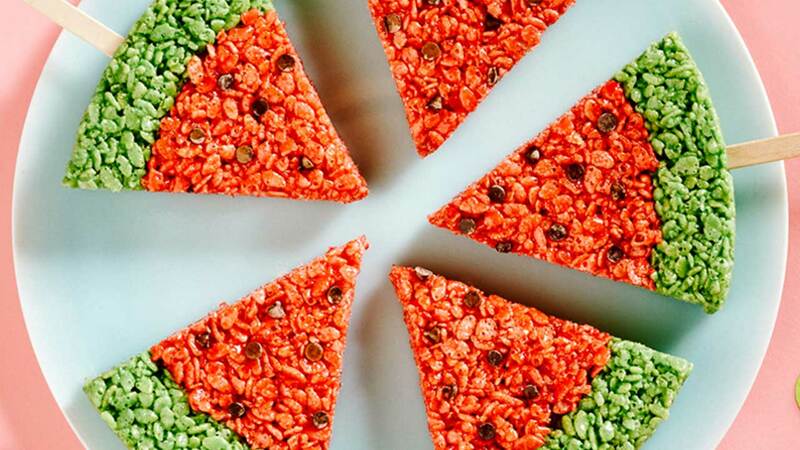 These Watermelon Rice Krispie Treats are festive for the hot weather, plus, they're mess-free. (We're sure we won't hear any complaints from our kids.) The pretty watermelon fake-out will be the prefect dessert for your next barbecue. 1. Spray a 9-inch round cake pan with non-stick cooking spray, set aside. 2. For the rind, melt 1 1/2 tablespoons butter in a medium non-stick saucepan over medium heat. 3. Add in 2 1/2 cups marshmallows as well as the green food coloring, stirring until the marshmallows have melted. 4. Remove from heat and stir in 2 cups rice cereal until evenly coated. 5. Pour into the prepared cake pan, let cool slightly, then spray hands with non-stick cooking spray and press around the outer edge. 6. Rinse and dry saucepan for the middle part of the watermelon. Melt 2 1/2 tablespoons butter in a saucepan over medium-low heat. Add in the remaining marshmallows and red food coloring, stirring until the marshmallows have melted. 7. Remove from heat and stir in the remaining cereal. 8. Repeat step 5, pressing the red portion of the watermelon into the center. 9. Let slightly cool, then sprinkle the chocolate chip "seeds" over the middle section (the warmer treats will make the chips stay in place). Then cut into 6 wedges and enjoy!